Strawberries are one of the healthiest foods you can eat. Strawberries are a popular part of spring and summer diets throughout America. Mouths water from coast to coast each spring, when small white blossoms start to appear on strawberry bushes. They announce the impending arrival of the ruby red berries that so many people crave. Ripe strawberries taste sweet and have only a slight hint of tartness. They are also one of the healthiest fruits around. There are countless recipes for the luscious red berry, but many people prefer to eat them fresh and unaccompanied. A strawberry is a red fruit that grows on small green bushes. It is the only fruit that grows seeds on the outside of its flesh instead of the inside. The Iowa Department of Agriculture and Land Stewardship states that each ripe strawberry contains as many 200 tiny seeds on its surface. The plant reaches peak production in the late spring, summer and early fall in most parts of the country. However, warmer places, such as southern California, can sustain strawberry growth throughout the entire year. This allows consumers the opportunity to purchase strawberries all year long. The USDA Agricultural Research Service proclaims strawberries are the favorite fruit of over half of all Americans. Indeed, for many reasons, scores of people are devoted strawberry consumers. The crop is abundant and easy to cultivate, which makes it inexpensive during its peak season. The flavor of the ruby red berries is predominantly sweet and mild. Ripe strawberries rarely have a sour or bitter flavor. The berry's versatility as an ingredient in food and beverages allows people to vary the ways in which they consume the fruit. Strawberries are not only delicious, they are healthy, too. They are one of the healthiest fruits a person can eat. The berries contain antioxidants, fiber, folic acid and more vitamin C than any other berry. They also have a lot of water in them, which is why they are so juicy. Strawberries are also low in calories and fat-free. Few ingredients are as versatile as the strawberry. Many people enjoying consuming the fruit all by itself. Some people dip the berries in cream. They are a popular ingredient in fruit salads, yogurt, ice cream, milkshakes and smoothie drinks. Strawberries have also become increasingly popular as a component in savory salads, where most or all of the other ingredients are salty, instead of sweet. If a person cooks strawberries with gelatin, they can makes jams and jellies. The beloved little berries are also wildly popular in baking. Strawberries are the best-known match for pound cake. Together the ingredients yield strawberry shortcake. They can also be a leading ingredient in pies, tarts, danishes or cakes. Strawberries are also a classic cheesecake topping. 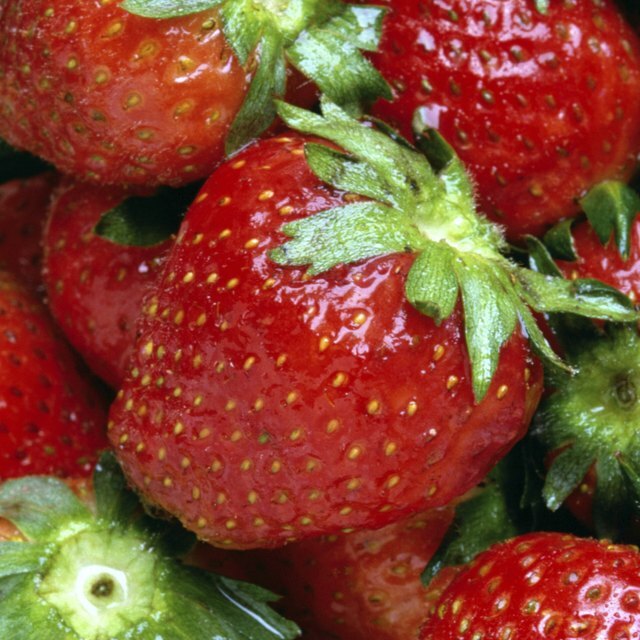 Kansas Department of Health and Environment: Farmer's Market Fact Sheet: In Season: Strawberry!